This year’s May Leadership Series Special Event will feature Richard Blackburn of the Lombard Mennonite Peace Center in Lombard, Illinois. Richard Blackburn is Executive Director of the Lombard Mennonite Peace Center. He has broad experience as a trainer, mediator, and consultant with conflicted churches and their leaders. The congregational mediation model he developed represents a transformational approach, placed within the context of Bowen family systems theory. For several years, he attended Edwin Friedman’s Post Graduate Clergy Seminar in Family Emotional Process in Bethesda, MD. Richard also participated in the Postgraduate Program in Bowen Family Systems Theory and Its Applications at the Bowen Center for the Study of the Family in Washington, D.C. Focusing on Self: How Have You Experienced Cutoff in Family, Church and Society? 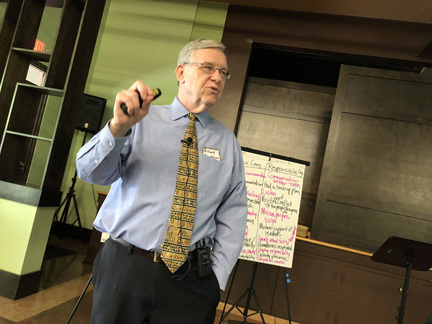 Theme: “Taking on Relationship Challenges: Managing Self and Coaching Others in the Family and Congregation” and featured guest speaker John Engles. Theme: “The Self and The Systems: Emotional Process and the Management of Chronic Illness and Death” and featured guest speaker Dr. David Scott Hargrove. Theme: “Systems Skeletons and Saints: Navigating the Hidden Past” and featured guest speaker Mickie Crimone. Theme: “Getting out of Triangles? Managing Yourself in Life & Leadership” and featured guest speaker Laurie Lassiter, Ph.D., MSW. Theme: “Cooperating for a Future” and featured guest speaker Priscilla J. Friesen, LICSW. Theme: “Polarization in Society and in Congregations: Understanding It & Addressing It” and featured guest speaker Ronald W. Richardson. Theme: “Money and Your Ministry” and featured guest speaker Margaret Marcuson. Featured guest speaker Israel Galindo. Featured guest speaker Rev. Dr. Larry Matthews.